Now that Oscar has 2 teeth, he’s decided it’s time to go ahead and knock out about 100 more of those pesky milestones. I think we’ve created a monster! A lot of NEW going on around here and conveniently located in one picture! New Face – a combination of excitement at whatever toy he is going for (in this case a rubber ducky) and the realization that when you wrinkle your face up and sniffle it makes a funny sound! All fours – this was taken right before he lunged for the ducky. 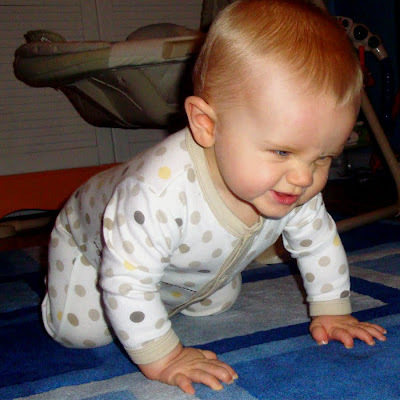 Once he lunges, he is back to the belly crawl. But he is up on his hands and knees quite a bit as of late, so the belly’s days are numbered. Teeth! – Ok this one is a stretch, but as Oscar’s mother, I can promise you there are teeth in this picture. I am still trying to get a good shot of them but I have to be careful. Those suckers are sharp! Let the fun begin! Yay Oscar. Oh my…that face is priceless. So cute! I think that kids facial expressions when they are little are priceless. It is these days that you will miss when they are all grown up. That face is gorgeous.